I have officially reached that point in the year when my garden overwhelms me. We just moved into our house last fall, so this is the first year I have seen the garden in action. Up until now I have been diligently watering almost everyday desperately trying to keep things alive in this heat. My husband and I have been learning our new irrigation system, fixing broken sprinklers, and readjusting spray patterns as brown spots appear. We have taken out a few things that were obviously dead or dying and trimmed up some trees that were in desperate need (More on that in another post!). I have brought home a few plants from the nursery, but I have been trying really hard to wait to make any big plant decisions until I can see a full year in the garden, a very difficult thing when you work at Joy Creek! But last week pushed me over the edge. 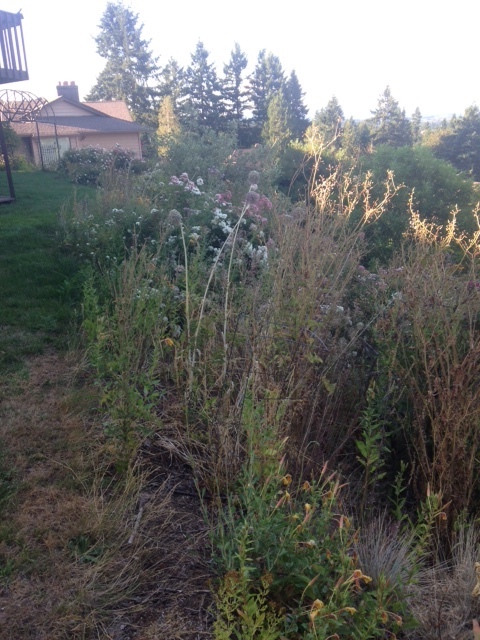 I walked through the backyard, down the hill overgrown with spent flowers, weeds, and a general mish-mash of random plants thrown in over the years, most towering over my head. I was almost in tears with the immensity of the project ahead. I came into work the following day and I started reading the old blogs on our website. I found this gem from Nadine, one of our landscape consultants. It reminded me that it is ok to ask for help, it leaves more energy for the fun part of gardening! I hope you enjoy this little blast from Joy Creek Blogging past as well. decision . So this is how my process went. to be done, so I had to prioritize my needs before I called anyone. latest time.) Numbers 2 and 3 made a specific time commitment. 10 minutes, he handed me my bid and left. gave me his estimate after about 20 minutes. don’t like my work, you don’t have to pay me. Garden class for many of the suggestions. I have to add that Joy Creek has a wonderful maintenance crew. Nadine didn’t consider them, but I feel like I will get in trouble if I don’t mention it. And I will probably be giving them a call myself! In case you missed the Hydrangea tour and talk with Maurice last weekend, here are a few highlights. The crowd favorite of the tour was ‘Merritt’s Supreme’. 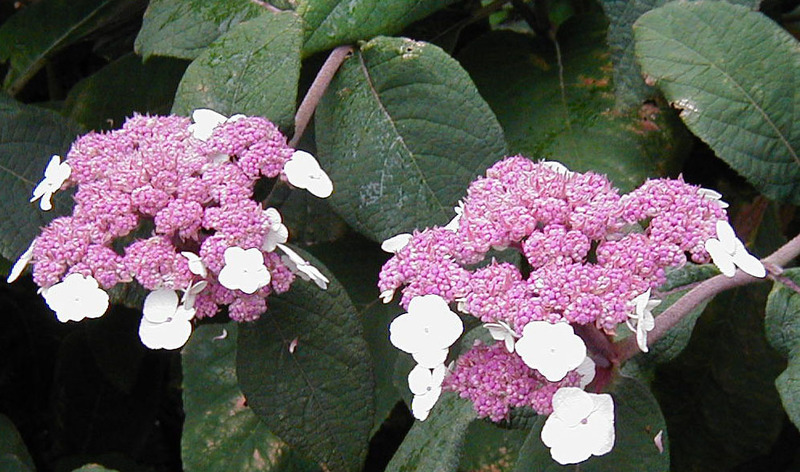 This Hydrangea is in the macrophylla family which includes plants with the classic mophead flower shape. 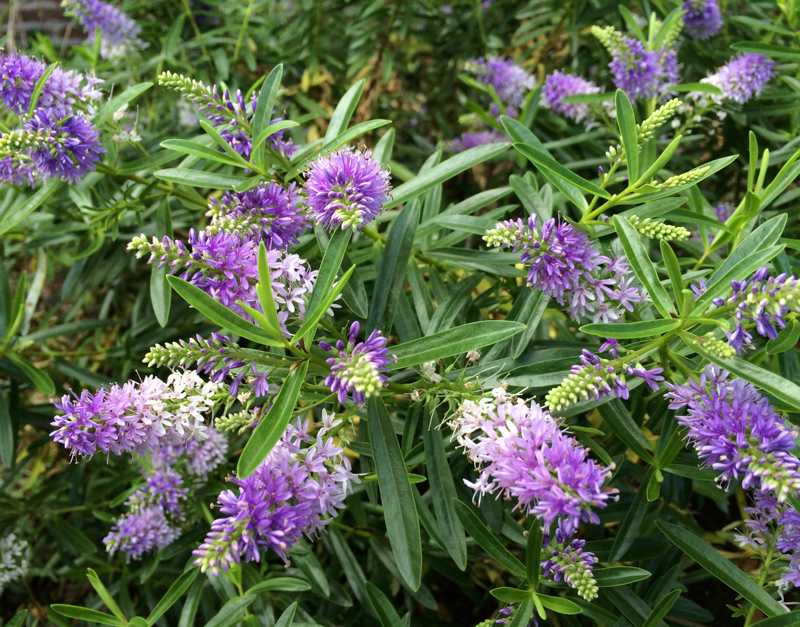 The color in our garden is especially striking, being an intense blue fading to purple. 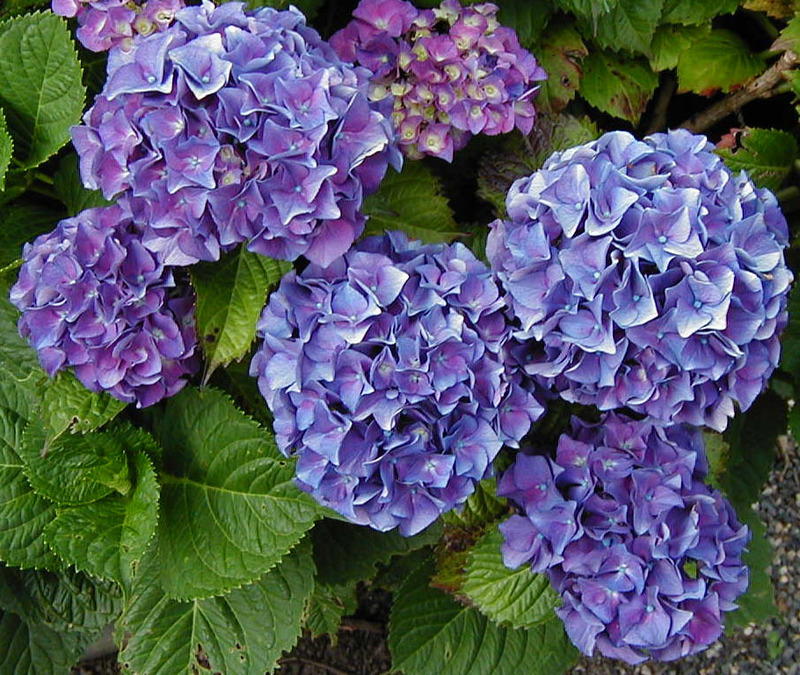 Remember, hydrangea’s will change flower color with different soil pH: 5.0-5.5 for blue flowers and 6.0-6.5 for pink flowers. Here in the NW our soils tend towards lower, more acidic pH levels due to the high rainfall which leaches out water-soluble minerals like calcium, which raise soil pH. To keep your soil even more acidic, try adding coffee grounds, fine bark dust or sawdust around your plants. The group also looked at the less common Hydrangea aspera. 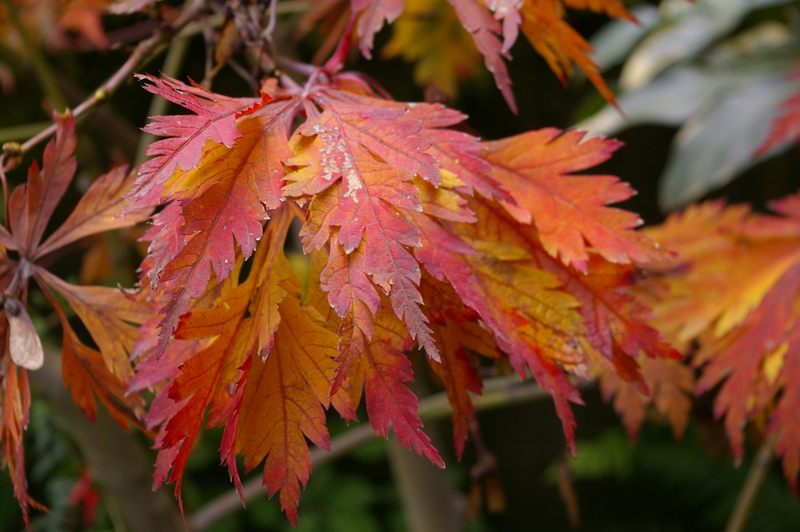 The latin ‘aspera’ means “rough-textured” and refers to the downy underside of the leaves. The aspera complex of hydrangeas is rich in species and selections of underused shrubs for our borders. We have several in our collection. 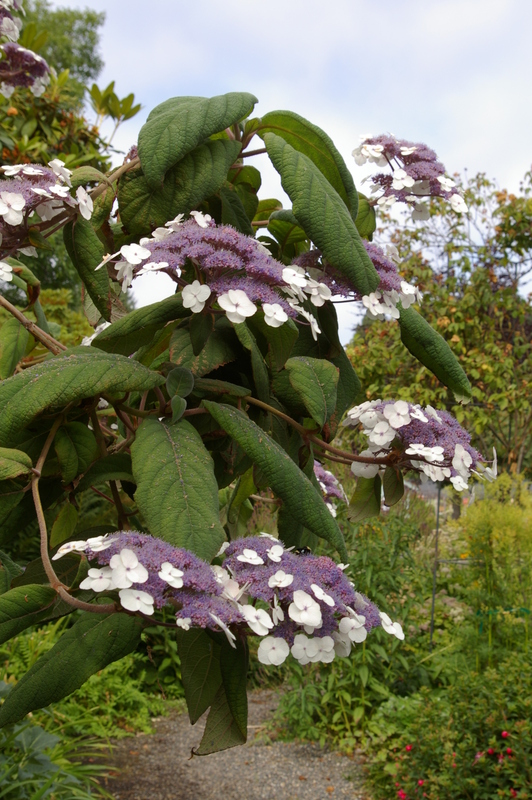 Hydrangea aspera ‘Macrophylla’ (Big-leaf Chinese Hydrangea) is an exceptionally attractive large shrub. 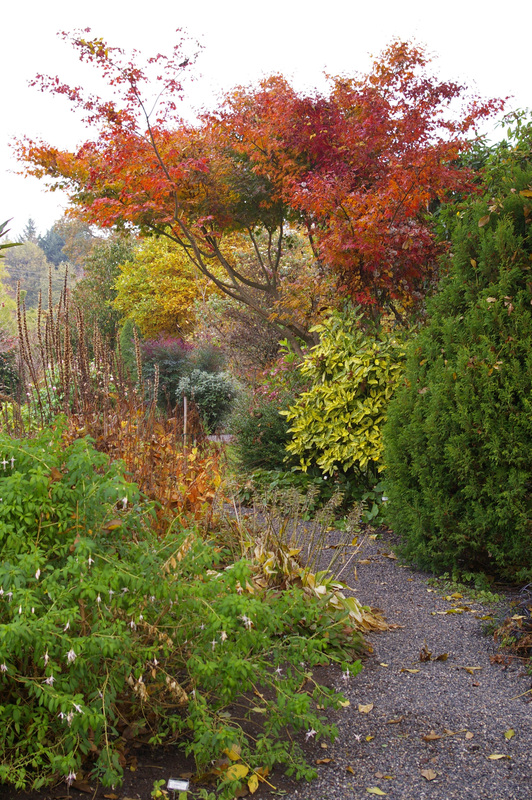 It recently gained the Royal Horticultural Society’s Award of Garden Merit. The lacecap flowerheads are proportionate in scale and domed. Good-sized, antique white sterile florets encircle the sizable, fuzzy looking cluster of fertile florets. The “macro” leaves referred to in the cultivar name are a good 10 inches in width and are covered with a felt-like layer of fine hairs. This felting is echoed in the young wood as well where new growth is similar to the velvet on a deer’s antlers. Hydrangea aspera var. robusta is magnificent and somewhat mysterious in appearance. This selection of Hydrangea aspera has immense wooly leaves that are just shy of a foot long and five inches wide. Purple leaf petioles add to the allure of the plant. 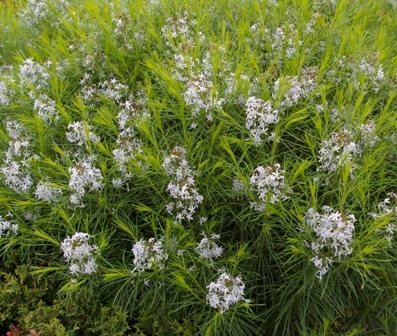 In addition, the matte green leaves recurve along their edges as if trying to imitate the rounded shape of the large, six-inch lace-cap inflorescences. 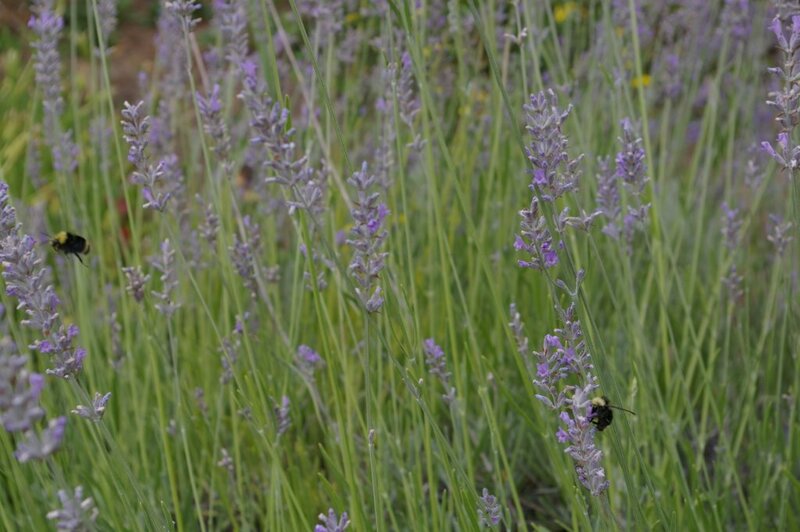 The fertile flowers are lavender pink and fuzzy in appearance. 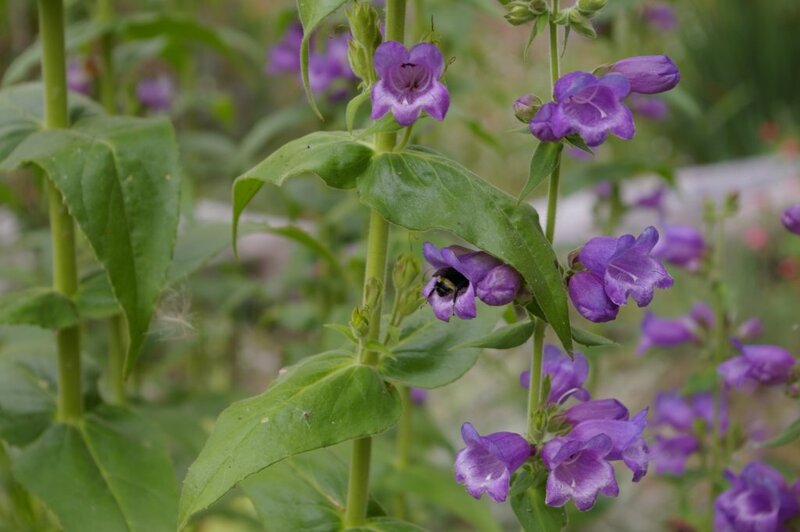 They are surrounded by white sterile florets consisting of four (occasionally 3 or 5) sepals. The flowering stems are covered in velvet like that on deer’s antlers. The rust colored bark on the older branches defoliates much as birchbark does. Overall it was a fantastic tour and a unique opportunity to spend a few hours with Joy Creek Nursery owner, Maurice Horn in the garden. Looking forward to next week’s class ‘Cuts from the Garden’ with our plant propagator, entomologist and plant pathologist, Leslie Glover. She will talk about ways to use all aspects of your garden to create beautiful cut flower arrangements. Hope to see you there! Once again, Maurice is going to lead a tour through the garden to look at our Hydrangea collection. Joy Creek Nursery houses a large collection of hydrangeas, not only the showy mop-head and lacecap types that are familiar to the public but also less common species, climbing forms and close hydrangea relatives. 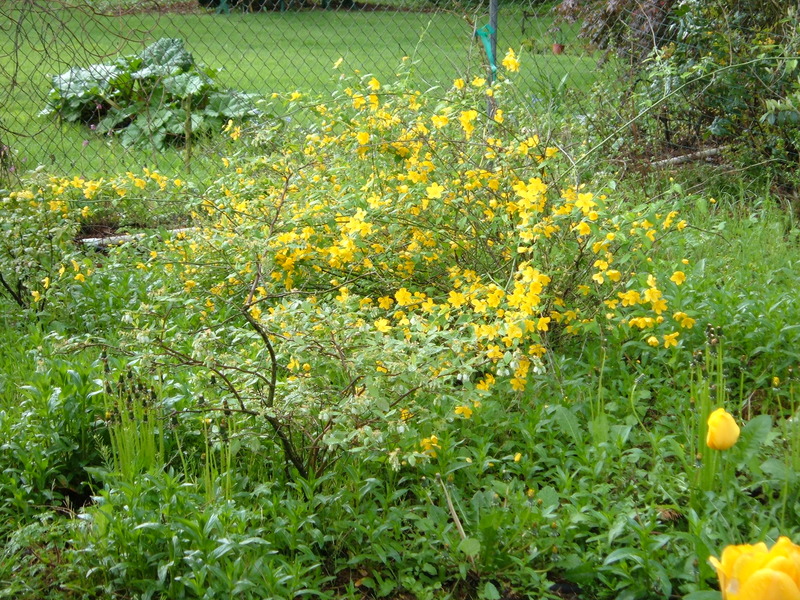 Many of these shrubs are more than 20 years old in the garden and will be at their best in July. This tour is designed to acquaint gardeners with the large variety of hydrangeas that are available and to teach good cultural practices. 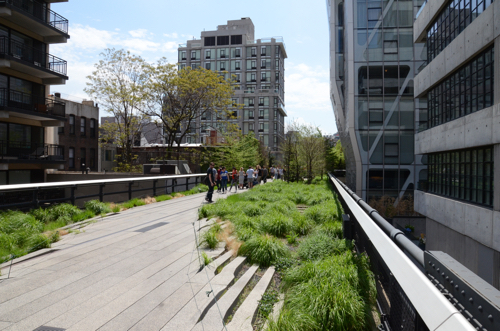 I recently visited the High Line in New York City. 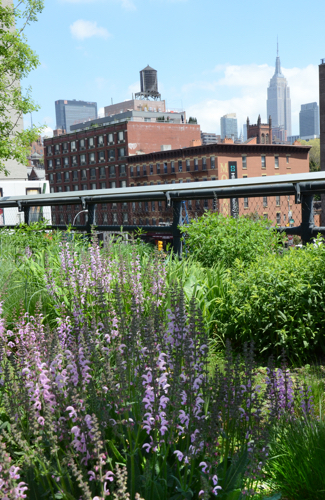 It is a beautiful garden that weaves through a part of town on a reclaimed elevated railway. 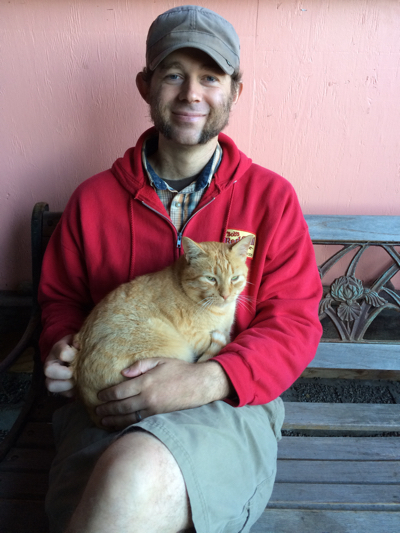 It was an inspiring garden that I wanted to write about, but what would people want to hear about in a blog post from a nursery. One thought that I kept getting stuck on was, how could you translate what you see in a large and singular public garden into ideas for your own yard?. 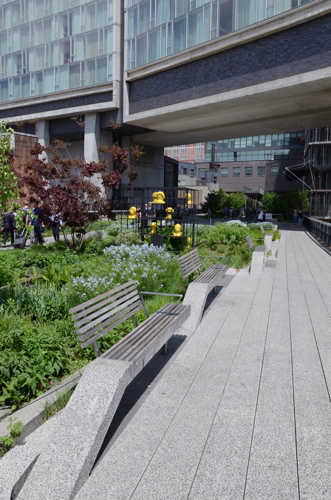 I came up with seven topics to look for in any garden and look at the High Line through those lenses. A Sense of Place. Every garden and location has its own personality. Much of this is out of your control. But you still get to choose how you and your garden relate to the environment around you. This can be embracing a view, framing it so that the eye wanders outwards. It can also mean enclosing your garden into a private sanctuary from the outside world. Don’t forget sounds and smells and other sensory information. 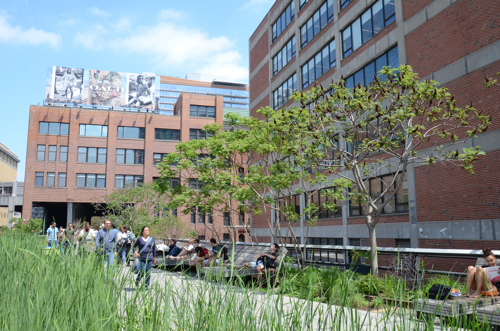 The High Line is very much a park in the city. 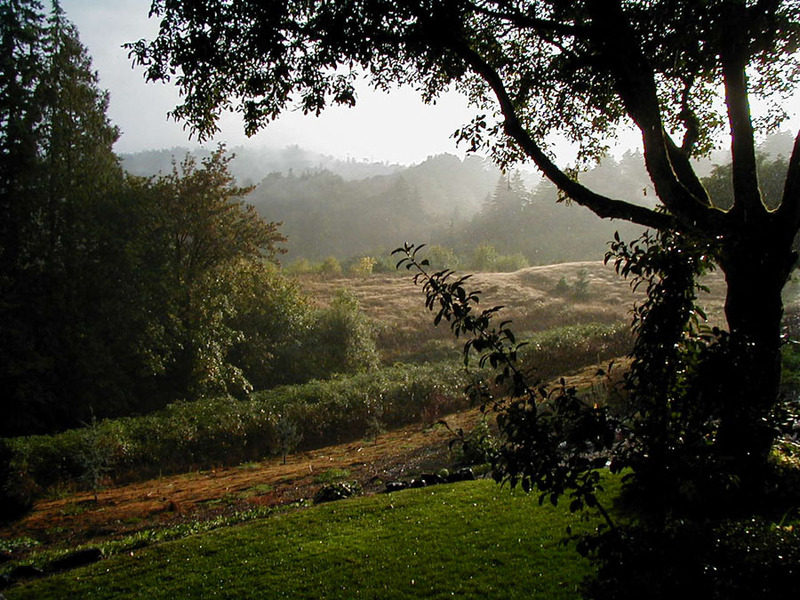 It has open meadow areas and wooded pathways but the city is always present. I found that I was better able to appreciate the buildings and views around me, both from being two stories up but also not having to deal with traffic trying to run me over. It provided a 1.5 mile stroll through the city while somehow feeling apart from the chaos. It was still crowded and the construction noise was ever present but there is no avoiding that. 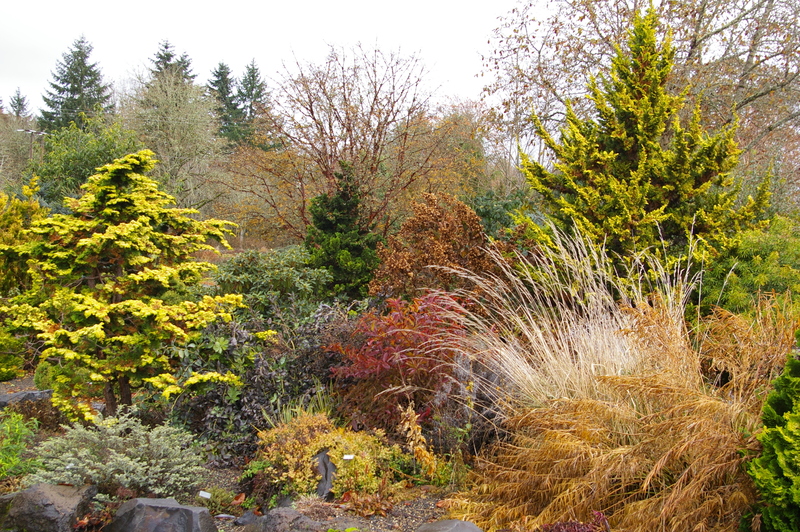 Massed grasses have a softening effect. Planting Style. 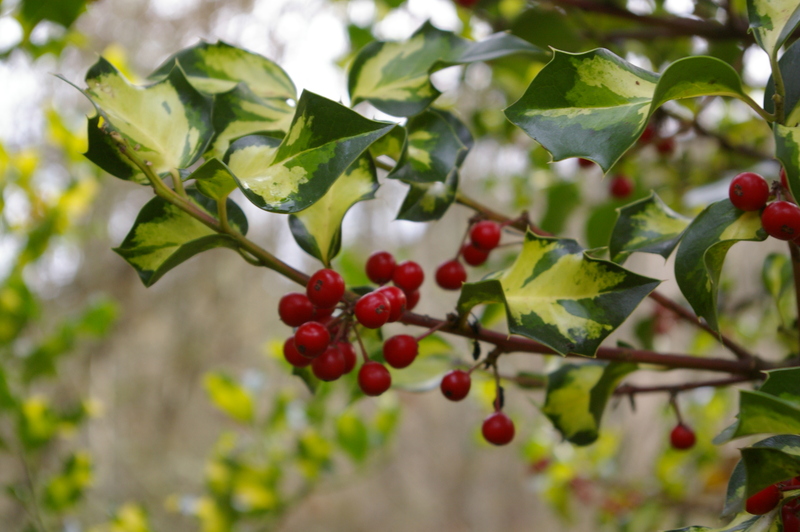 Every garden has a plant palate that they choose from. The site can dictate what plants can be grown, but the designer will influence what choices are made in plant material and layout. A grove of Magnolias grow in a shady area between two buildings. 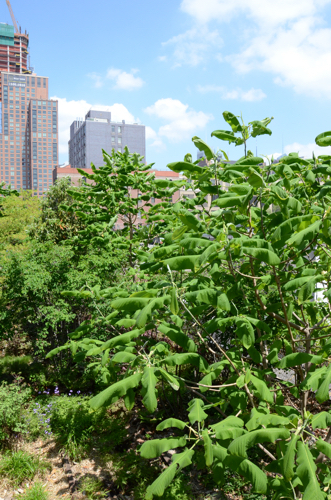 Since the High Line has limited soil depth there are no large trees, but the effect of a woods was still created with 15 foot trees planted in mass.The plant layout is very informal, creating a spontaneous impression. I have read that they were trying to recreate the look of the abandoned railway gone wild that existed before it was turned into a park. In your own yard you can create cohesion using similar planting styles throughout, or add tension by having a wild meadow next to a formal knot garden. Repeated Themes. Does your garden have a theme? 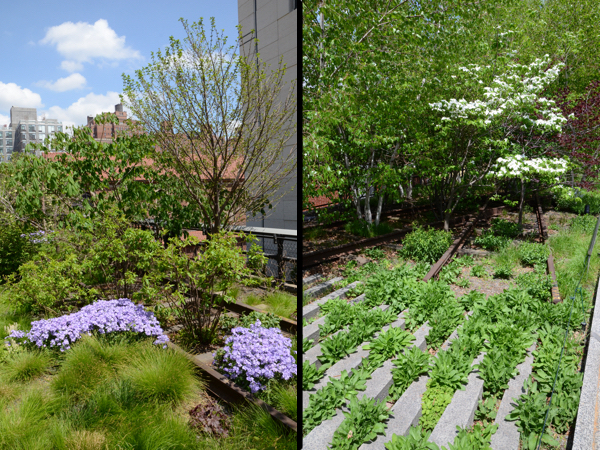 The theme that stood out to me in the High Line was the contrast of hard straight lines (train tracks, lined pavers, the long narrow shape of the garden, and the vertical buildings on all sides) with a soft wild planting style. This is what sets this garden apart from any other I have seen. The contrast of these ideas is brought off everywhere. 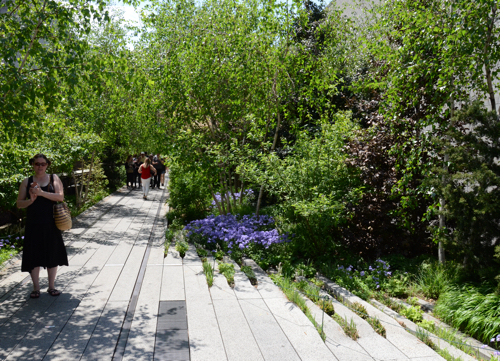 The paths dissolve into horizontal lines in the ground and plants start popping up between pavers. Movement through the garden. You experience a garden as you move through it. Small gardens can be built with a fixed viewpoint but it is so important to look at how people will travel through your garden. 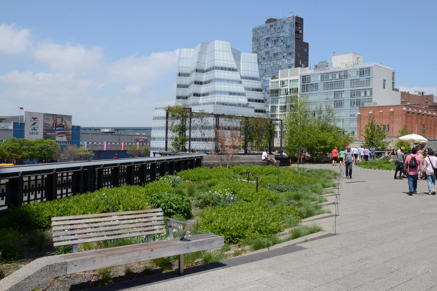 The High Line is a long straight line with a curve at the end. The path is not straight nor the same size throughout. There are open straight meadows but the path will curve over the the edge and lead you through a narrow wooded section. There is a section where the path turns into a walkway over a woodland bed of ferns. With the heavy traffic, thankfully there are alcoves that go nowhere where you can step out of the flow to relax. At some points it is wide open. The path narrows into a tight wooded corridor. Plants that you Recognize. I love being in a garden and recognizing plants that I grow in my own garden or we sell at Joy Creek. Outside of annoying my wife with all the botanical plant names, this is one of the easiest ways to get ideas for your own garden. Seeing amsonia growing between two pavers is something you could directly steal for your own. 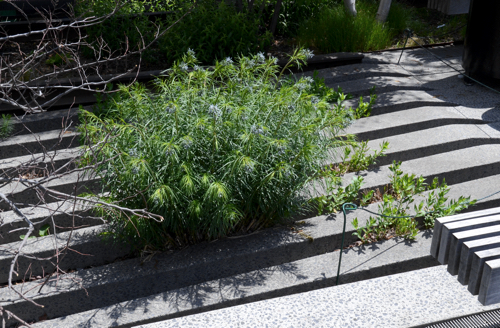 Amsonia softens the hard edges of the cement. Look for New Plantings and Old. 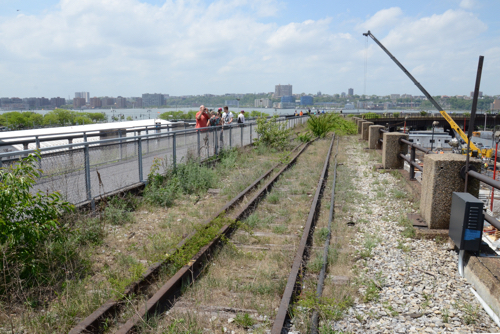 One of my favorite parts of the High Line was at the far end where they are still doing construction. There is a section where you can see what it looked like before it was turned into a park. 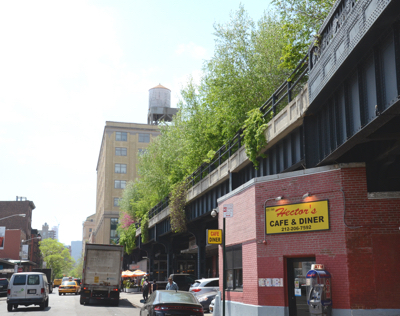 The wild plants that seeded their way onto the tracks. This shows the inspiration that lead to the designed wild look. There is still some of the original line left. There are also sections that are newly planted. 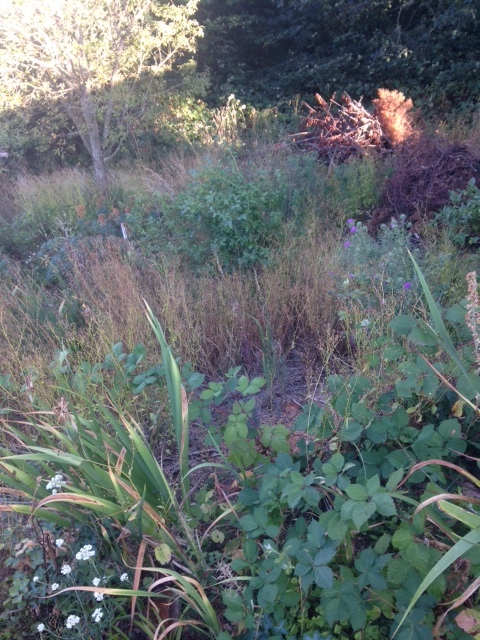 This shows the planting patterns that will eventually lead to the look of an unplanned meadow. You can see how much effort it takes to look natural. You can see how new plants are laid out to create a natural effect. How is the garden being used. The last part I wanted to highlight is to look at how all the people in the garden are interacting with it. You could use the park as a elevated shortcut through the city, but what I noticed was how many people were sitting and enjoying the scenery. There were benches everywhere. The benches were not just for sitting, they were part of the look of the park. These extremely large benches were very enticing. The walkway flows up into the benches. 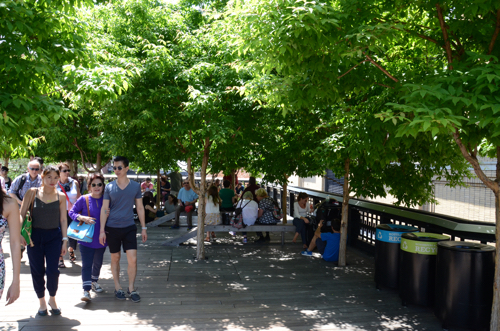 Trees were planted close together to create a shady resting spot. 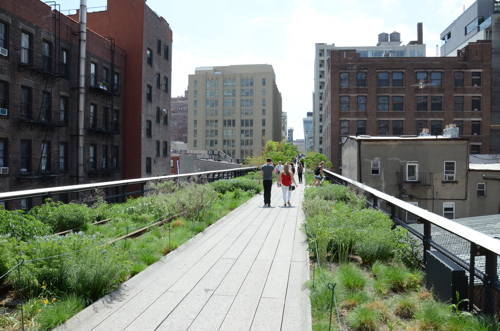 If you ever get a chance, I highly recommend visiting the High Line in New York City. 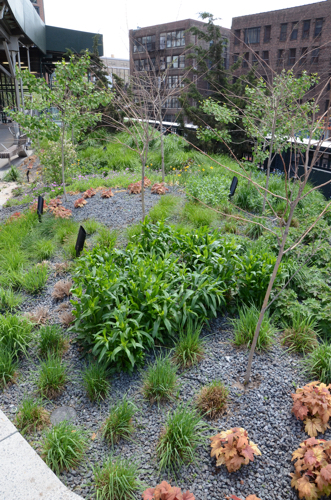 It is a singular garden crafted out of unused urban infrastructure that has revitalized a neighborhood. 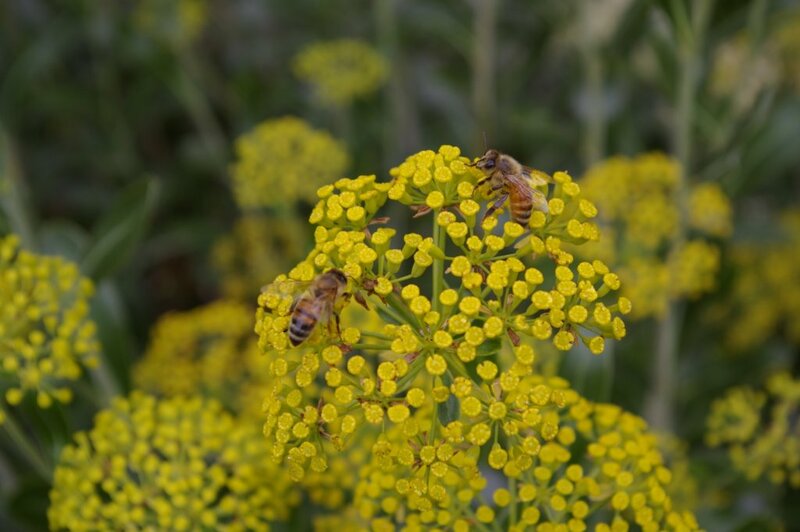 Each garden you visit will teach you new concepts in gardening and inspire your own planting domain.